Universal Bar Maintenance Tools: Jack's is your Place! 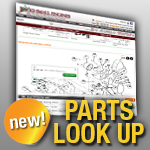 We have the Bar Maintenance Tools you need, with fast shipping and great prices! For chainsaw parts and accessories, think Jack's! This compact tool is perfect for dressing up your chainsaw bar rails. It easily removes the minor damage you bar incurs from daily cutting, removing burrs and knife edges that can lead to premature wear. The tool can be used in varied positions, dressing both the top and sides of the bar. The handle is extremely durable, and replacement files are available. We highly recommend using quality gloves with this tool to lessen the risk of cuts. Comes stock with the fine file.